Walking out to the beach I was disappointed to see the tide was in, not only was it in, it was still climbing. I knew this would be the case but came anyway, hoping the very reliable tide time tables were wrong. You see, I just love low tide, love to walk along the shore, through the sand and rock pools just being, the silence and stillness the low tide brings sooths my soul, it slows my breath and allows me to be. The vast expanse of beach provides a sense of freedom I can’t find anywhere else. I savour each moment on the beach when the tide is out, I walk across sand that was hidden under the sea, I pad through the land of sea creatures. I am in Poseidons territory and yet he cannot claim me for his own as I walk across sand. You get it, I was disappointed. I sat down on the pebbles and looked at the sea, waves crashing towards me. Closer and closer they came, beckoning me, teasing me. 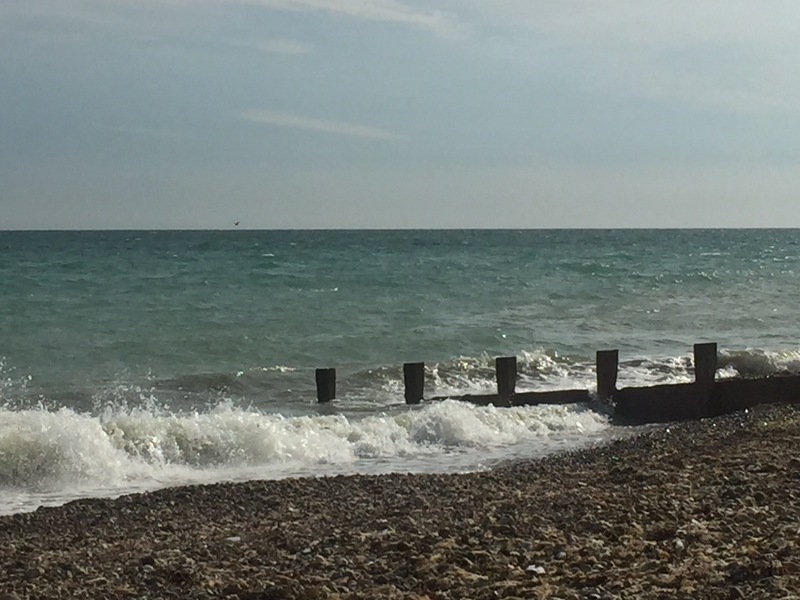 The foam of each wave, like lace, covering the shingle, pebbles sparkling like jewels as it once again subsided. The sea, I felt was dressing the land for the occasion. I sat and watched, immersed myself in the event and thought about integration, pondered on the blending of opposites. Nature teaches us so much, everything we look to in nature has a different message. If we spend our lives doing the same thing again and again, we miss out on expanding our minds, we miss moments that are extraordinary. Sometimes it’s right to look at things a different way, shift our perspective a little. As the sea came closer and closer, I watched the pebbles, once dried from the sun disappear into the sea, only to remain as a memory. A piece of seaweed rolled on the tide to land by my feet, a final bow on the costume. No longer disappointed I left for home, realising as I did, that each moment teaches us something new, to savour each and every one of them. Life happens when we are waiting for something else, if we don’t experience each moment, we might miss out. We might be so preoccupied with one thing that we miss everything else. She sure is! Such a beautiful post Liza. I’m glad you were able to see the beauty in the day after all.